Located in Greensburg, Indiana, NDES is a K–6 school that serves elementary school students living within the Decatur County Community Schools district. The Indiana Department of Education has designated our school a “Four Star School,” signifying our school family’s pursuit of academic excellence, from our hard-working students and dedicated staff to our wonderful parents and supportive community. 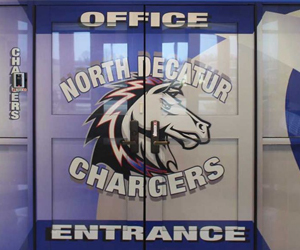 The North Decatur Community strives to help students develop to their full potential—intellectually, physically, emotionally, and socially—by nurturing the total child in an environment that promotes cooperation and respect, thus fostering a lifelong love of learning. North Decatur Elementary School understands the privileges and responsibilities of being a 1:1 school. Among these is the responsibility to be good digital citizens. We will practice good digital citizenship by being safe, responsible, and respectful users of technology. Staff will increase their own digital citizenship and digital teaching skills and model these through instruction and interaction with students. Students will use their devices to learn, create, and connect in a manner that protects private information, maintains a positive self-image, treats others with respect, and gives credit to other creators. Harmony 3 is the school management software used by Decatur County Community Schools. It provides some great features to parents and students, such as viewing grades, attendance, school fees, and lunch account usage and balances. Parents can create one account for all of their children at Decatur Community Schools whether they are elementary or high school students. Please contact your child’s school for your child’s access code so you can set up an account. You will need a separate access code for each of your children. You will also find instructions for setting up your Harmony 3 Family Access on this page.